Entry to the civil service provided an excellent opportunity for a young man to serve in various parts of the country as well as learn about the problems of the peasantry, which constituted the majority of the people of Sri Lanka. 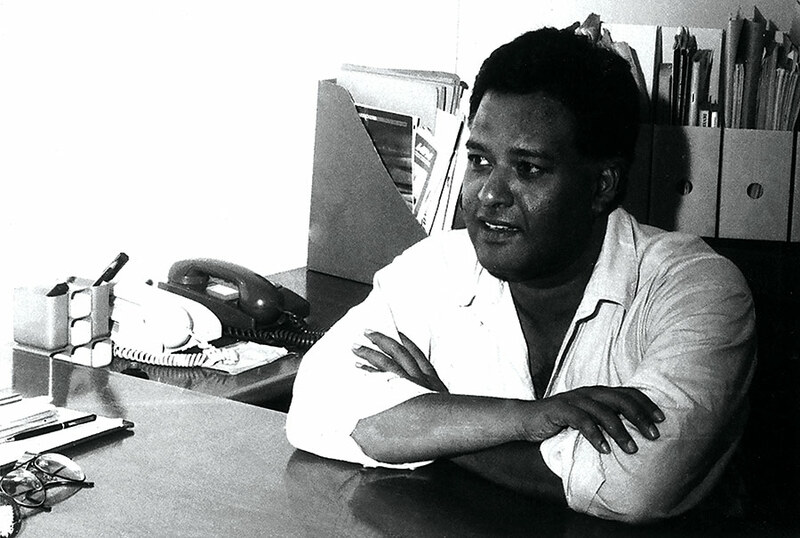 For Amunugama, who was already a trained social scientist, this was a dream come true. He threw himself whole heartedly into rural development activities in Kalutara, Ratnapura, Moneragala, Galle, Kandy and Matale districts. As luck would have it, he had done fieldwork with Tambiah and Obeysekere in Matale and Galle. He was able therefore to focus on the problems of the village poor - namely the lack of access to land and credit. His efforts at ameliorating the problems of villagers are remembered even today by the elders of those regions. Resettlement schemes - colonization schemes in the jargon of the bureaucracy - drew his particular attention. Under the leadership of Land Minister C.P. de Silva, Amunugama was a part of a select group of young civil servants who specialized in land administration. This group was fostered with great care by H.C. Goonewardene, who was a legendary Land Commissioner. When the Government Agent of Galle district, Donald Speldewinde, wrote of young Amunugama that he “is an extremely well mannered and pleasant officer to work with. He has a tremendous capacity for work and ability to get on with the job and is very suitable for a position of higher responsibility. Judged by every standard he is an outstanding officer”, Goonewardene graciously added “I have personal knowledge of this officer’s work when I was Land Commissioner. I’m in entire agreement with the GA’s observations”. During this period, Amunugama wrote several papers on issues of peasant settlement and rural indebtedness. Two such papers (on Chandrikawewa and Rural credit), were published in the Ceylon Journal of Social Studies which was edited by Ralph Pieris. A longer study on land tenure in a newly founded village settlement in Hambantota district was published by the Friedrich Neumann Foundation. He also helped to write the original report on proposed land settlement in the Mahaweli scheme for the World Bank. In 1964 Amunugama married Palika Weerasinghe, our mother, whom he had met while at Peradeniya University. While serving as Additional Government Agent of Kandy district, still only in his late twenties, Amunugama was handpicked by Prime Minister Dudley Senanayake, to lead the food drive as GA Matale. He was probably the youngest civil servant ever to be appointed a GA.
With the propagation of new agricultural practices, the paddy yield in Matale district doubled. This was helped by the rehabilitation of Devahuwa - one of the earliest colonization schemes, and the adoption of modern agricultural best practices in the Laggala area, particularly in the newly asweddumised Wilgamuwa fields. The close scrutiny of this dramatic increase in paddy production, which was a good example of his “Great Revolution”, by Prime Minister Senanayake and his Deputy Information Minister of the time R. Premadasa, led to a dramatic change in the career of the young civil servant. The Prime Minister sent for Amunugama and requested him to join his Information and Broadcasting Ministry as the Director of Information. The PM felt that his efforts at reviving agriculture were not being effectively communicated to the public. At that time the Permanent Secretary of the I & B Ministry was G.V.P. Samarasinghe - a very senior, efficient and influential civil servant. He was widely considered to be the “eminence grise” of the administration. The other senior official of the Ministry was Neville Jayaweera who headed the Broadcasting Corporation. The Prime Minister had just recently taken away the I & B Ministry from his Minister of State, J.R. Jayewardene and his Permanent Secretary, Ananda Tissa de Alwis. There was tension between the two leaders and Amunugama’s transfer may have been partly caused by a need to make a clean sweep of the media administration. Looking back, it appears that this fortuitous transfer changed Amunugama’s life and career completely. For the better part of his subsequent career, both in the civil service and outside, he was engaged in the field of journalism and information. However, as the Director of Information he upheld the norms of the public service and was able to contribute to the expansion of information facilities without political partisanship. This was confirmed by the fact that he was requested by the newly elected Prime Minister, Madame Sirimavo Bandaranaike in 1970, to continue in his post. This was the heyday of coalition politics, when the LSSP and CP played a significant role in the administration. It was not an easy task to satisfy all the partners in this volatile government. The information authorities were severely tested by two major political events during this time: the JVP uprising of 1971 and the creation of the new Constitution in 1972. The first uprising of the JVP was an unprecedented challenge to the democratic process. The coalition government had hardly been established when it was confronted with an assault from the left. Amunugama was, as it happened, in the frontline of events. On one hand the Information Ministry under R.S. Perera, was the refuge of the China and North The first uprising of the JVP was an unprecedented challenge to the democratic process. The coalition government had hardly been established when it was confronted with an assault from the left. Amunugama was, as it happened, in the frontline of events. On one hand the Information Ministry under R.S. Perera, was the refuge of the China and North youth, and the likes of N. M. and Colvin, who advocated a tough line, in the belief that the JVP were CIA agents. However, Madame Sirimavo preferred to be conciliatory and a leaflet was drafted by Ilangaratne and Amunugama, calling for the surrender and rehabilitation of the JVPers. A large number of these pamphlets were printed at the Government Press and airdropped in the areas in which the JVPers were hiding. Soon there was a positive response to this call and, ironically, Vidyodaya University itself became a rehabilitation centre. The incarceration of Information & Broadcasting Ministry colleagues on trumped up charges, which were supported by their erstwhile benefactor R.S. Perera, led to much conflict in office at that time. The Ilangaratne- R.S.Perera antagonism had led to the virtual detention of the former in his home under police supervision. There was also a misunderstanding between his Minister and Amunugama regarding the personnel to be appointed to the newly formed State Film Corporation, of which he had been appointed Chairman by the Prime Minister. To resolve the conflict Amunugama was transferred to another post and the Film Corporation was taken away from R. S. Perera’s Ministry and attached to the PM’s office. Receiving Dr. Mahathir Mohammed, former Prime Minister of Malaysia. Amunugama who thus left the Information Ministry and was appointed the Director of Rural Development. This enabled him to resume his links with the Sarvodaya movement and his friend A.T. Ariyaratne. It is noteworthy that it was during this period that Amunugama supported Sarvodaya to obtain foreign assistance, particularly from the Freidrich Neumann Foundation, in spite of the fact that Minister Felix Dias Bandaranaike was strongly opposed to Ariyaratne’s organization. 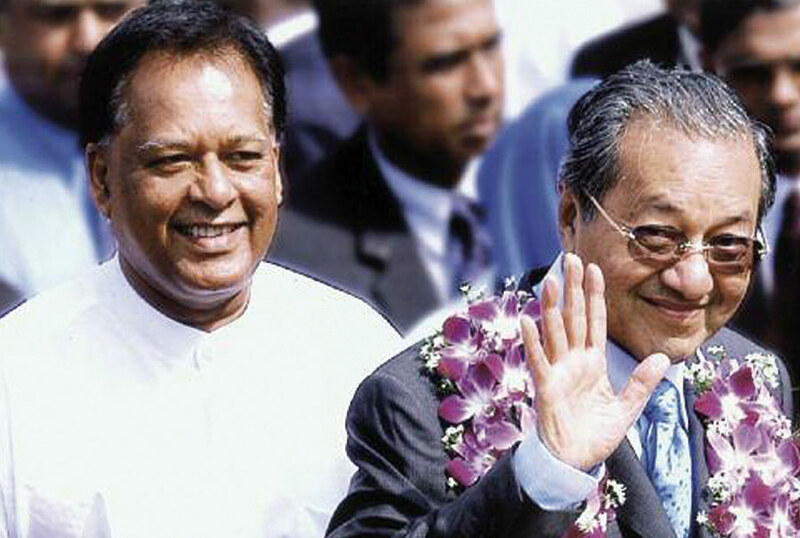 Amunugama’s gesture has been publicly acknowledged by Sarvodaya on many occasions. With his departure from the Information Ministry, Amunugama decided to resume his academic interests. He was awarded a scholarship by the Government of Canada and proceeded to the University of Saskatchewan to work with the celebrated communications scholar Dallas Smythe. This was the time of the Vietnam war and Smythe, who had worked on the ‘New Deal’ under the Roosevelt administration, had migrated to Canada together with several other scholars who had been persecuted by Senator McCarthy. An extremely largehearted and generous teacher, Smythe became Amunugama’s lifelong friend and mentor. Having obtained a Master of Arts degree he returned to Sri Lanka in 1973 and was attached to the Ministry of Public Administration under Felix Bandaranaike. With little creative work to do, Amunugama began lecturing at the Colombo University and undertaking research on agrarian problems with fellow scholars in the Agrarian Research and Training Institute (ARTI). Many of these studies were published by ARTI. He also undertook extensive research into family health and population planning. A research study by them on family planning in Sri Lanka was published in Geneva in a book edited by Angela Molnos. The change of Government in 1977 led to an invitation from D. B. Wijetunga, who had been appointed the new Minister of Information and Broadcasting, to Amunugama to take up the position of Permanent Secretary of that Ministry. What followed was a period of rapid change in the news and information sphere. The most dramatic was the introduction of television to the country. The new President J. R. Jayewardene, was a proponent of TV. In fact, this had been one of the areas of disagreement earlier with Dudley Senanayake, who had been advised by officials that it was like the gift of a rhinoceros. Now that he held the reins of office, Jayewardene wanted to fulfil a wish which had been thwarted earlier. All the negotiations for the obtaining of a fully fledged, state-of-the-art TV station on a grant basis from the Government of Japan were conducted by Amunugama. In fact he succeeded in convincing the Japanese authorities that they should even undertake the building of the studio complex. He also negotiated with Freidrich Ebert Foundation of Germany to build and equip a TV training centre, which was later to become the ‘alma mater’ of many of the local television personnel. Another important step was the setting up of regional radio stations. Using the medium-wave transmitters which were gifted by the Federal Republic of Germany, broadcasting stations were set up in Kandy, Anuradhapura and Matara. A large number of artistes who today dominate the cultural scene got their initial break in those regional studios. Equally importantly, Sri Lanka began to play a leading role in the global debate on the New World Information order. The team which comprised of Esmond Wickremasinghe, Arthur C Clarke and Sarath Amunugama, were able to play a constructive and valued role in this debate. Sri Lanka was elected to the Inter-governmental Committee on Information in UNESCO, which was designated the lead agency for Information Affairs in the UN system. Following these interventions, Sri Lanka’s experiences in promoting information flows drew the interest of the global community. The Arthur C. Clarke Centre for Modern Technologies was established within the Katubadde Campus. NASA contributed two giant telescopes at Clarke’s bidding. The building that housed the centre was designed by leading architect Ashley de Vos, as a labour of love. Clarke donated the money awarded to him with the Marconi prize. Later, the IPDC of UNESCO, under the stewardship of Amunugama, made a substantial contribution to the centre from its funds. 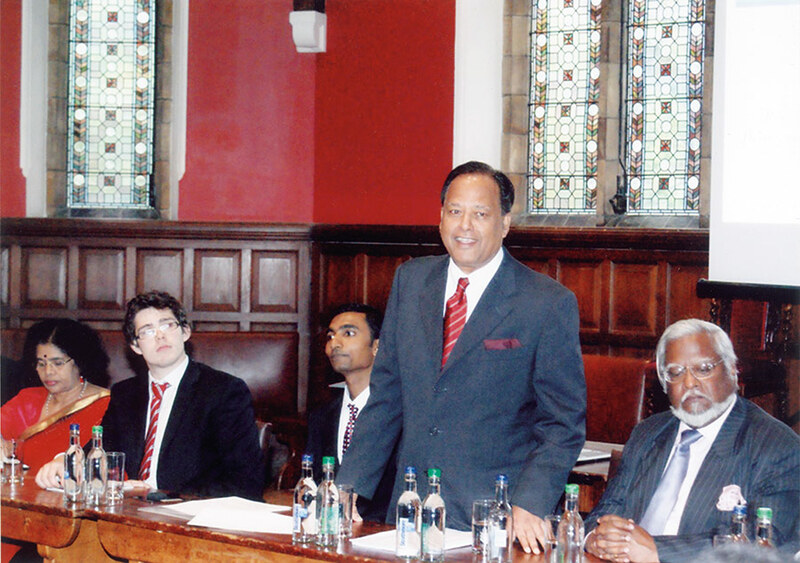 Speaking at the Oxford Union. Another pathbreaking development in this field was the link established with the InterPress Service - the Third World news agency. Its founder, Roberto Savio was a highly innovative media manager who tried to give practical expression to the cry for balanced reporting in the media. Savio wanted to add a Third World perspective in presenting news. During this period Sri Lanka was made the regional hub of IPS. All these innovations drew the attention of the global community and brought our media specialists to their notice. Consequently, Amunugama was not only invited to most major international meetings on media organized by UNESCO, but was also offered several prestigious postings in this field. The Freidrich Ebert Foundation offered him the post of Secretary-General of AMIC - the Asian Mass Communication and Information Centre, located in Singapore. After serving several months in this position, he was made the Director of the International Programme for the Development of Communications (IPDC). This was a senior position in the UN system and was tenable in UNESCO, Paris. He was also appointed a consultant to the UNDP, together with Hernan Santa-Crusz, former Foreign Minister of Chile, to seek the assistance of Heads of State to set up a Development News Network under the auspices of the United Nations.